Enter Now! 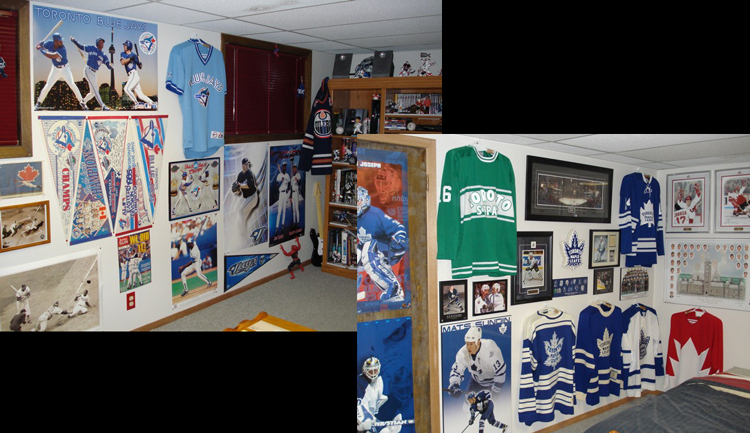 “Share Your Fan Wall” Contest – Over $200 in Prizes! 1st Prize – $100 spending spree at SportsPosterWarehouse.com! 2nd Prize – $50 spending spree at SportsPosterWarehouse.com! 3rd Prize – $25 spending spree at SportsPosterWarehouse.com! Plus: Three additional random giveaways for the rest of the field. Use your smartphone, camera, or tablet to take nice pictures of your best sports walls. They could be walls you have decorated at home; in your office; at your bar or restaurant; your recreational facility; your classroom; or anywhere else you have added sports to the decor. Send the best of your pictures to: info@sportsposterwarehouse.com, along with a brief description that will help us add context to your entry. 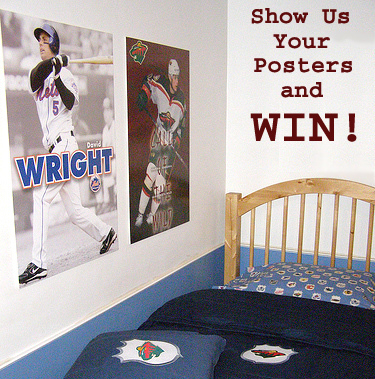 You can also tweet your entry to us @sportsposters or post it on our Facebook page. Check out our Facebook page and Twitter. Like and follow us for regular contest updates, including pictures from the contenders, as the month of March rolls along. On April 2, 2013, our panel of judges will choose the top three entries, and contact the winners! Please send in your pictures as soon as possible – don’t miss out at this valuable opportunity to WIN! 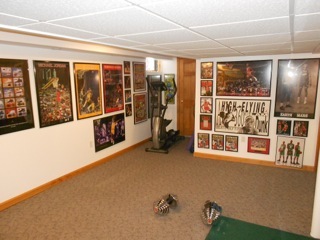 We’ve had some great entries already, check out the sports den from Craig Van Guilder, of South St. Paul, MN. Western New York spots fans are some of the most passionate, knowledgeable, and loyal in North America. Unfortunately, they have also been the longest-suffering fans, having enjoyed not a single major pro sports championship since Jack Kemp (may he rest in peace) QB’d the AFL’s Buffalo Bills in 1964 and 1965. 10. Doug Flutie “The Flutiemaster” – While some Bills fans will never forgive him for costing Rob Johnson playing time and acting too confident, Doug Flutie’s three-year run with the team in the late 1990s was nothing short of brilliant. In 30 starts, he recorded a 21-9 record, truly earning the nickname “The Flutiemaster” coined with this poster released during his miraculous late-season run to the playoffs in 1998 (limited quantity still in stock at SportsPosterWarehouse.com). 8. Dominik Hasek “The Dominator” (Old-School Uniform) – Norman James Corp. 1995 – While Dominik led the Buffalo Sabres to the Stanley Cup Finals in the new-school uniform (unveiled in the fall of 1996), he first rose to prominence in the old-school unis. This amazing poster, released by short-lived Canadian publisher Norman James Corp., gives you a glimpse at Dominik as he appeared during his earliest moment of magic – his role in the “Mayday” game against the Boston Bruins during the 1993 playoffs. This is, as far as we know, the only poster published featuring Hasek in this uniform. 7. Thurman Thomas “The Thurmanator” – Costacos Brothers 1991 – From the late-1980s, early-1990s heyday of Costacos Brothers theme posters, this one is still highly sought after by Bills collectors, and was such a great seller back in the day that the publisher came out with a sequel – “Thurmanator II” – in 1993. 6. Gilbert Perreault & Rick Martin – Sports Posters Inc. (Lewis Portnoy) 1973 – A Hall of Fame photographer for the amazing results his innovative arena strobe techniques produced in the early 1970s, Lewis Portnoy was a true innovator and entrepreneur. 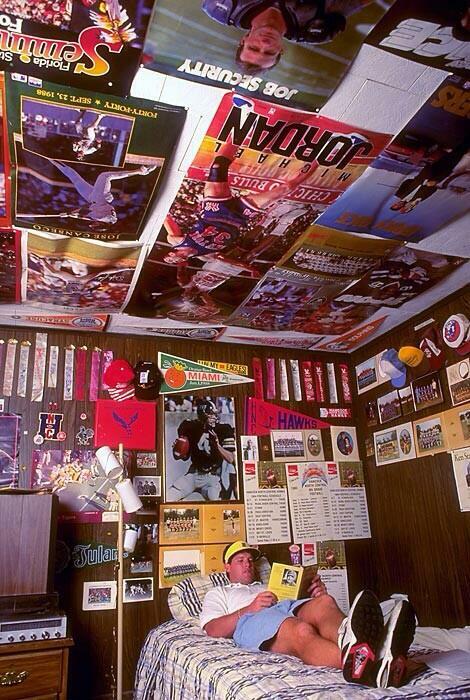 From 1973 to 1975, the St. Louis-based snapper marketed his own line of posters from his amazing library of images. The upstart Sabres had two entries in the series, pictured here: Gilbert Perreault and Rick Martin. (Note: a limited quantity of these posters is still available from The Sports Poster Warehouse in The Portnoy Collection section). 5. O.J. Simpson Action Poster – Studio One 1973 – From 1972-78, the sports posters you could order from those “checklist” advertisements in Sports Illustrated magazine came from the Studio One corporation. SI-SO posters were printed on a very delicate paper stock, making it very difficult to find them in decent condition. Further, unlike some of the earlier SI posters published by the Renselaar Corporation from 1968-71, we are unaware of any major warehouse finds of this era’s posters, making many of them impossible to find in any shape! While most of us wish we never had to see O.J.’s guilty mug ever again, no one wants to forget the football magic he brought to Buffalo in the 1970s – especially the 2000+ yard 1973 season, the year this classic was published. 4. Winter Classic 2008 Panoramic Poster Print – Everlasting Images Inc. – If you are a hard-core Western New York sports fan, you were probably at Ralph Wilson Stadium on January 1, 2008, at what will certainly be remembered as one of the most fondly-remembered sporting events in Buffalo history. From legendary panoramic stadium photographer Rob Arra’s brilliant Everlasting Images collection, this brings the day alive with class and style. (Note: this poster is still in print, available here from SportsPosterWarehouse.com). 2008 Winter Classic Panoramic Poster Print – Everlasting Images Inc.
3. Bob McAdoo Buffalo Braves Action Poster – Studio One Sports Illustrated 1974 – Few outside of Western New York have any idea that there was an NBA franchise in Buffalo in the 1970s…and the team was actually pretty competitive! The team was led by superstar Bob McAdoo, the #2 overall draft pick of 1972, who brought the high-flying athleticism of North Carolina hoops to the Aud (and Toronto’s Maple Leaf Gardens for a few games every year). This impossible-to-find poster found its way into SportsPosterWarehouse.com’s permanent collection via eBay many years ago…and we’ve never seen one offered for sale since! A truly rare historical relic. 2. “Buffalo ’66” Bills Theme Art Poster – Unknown Publisher 1966 – No, this is not from Vincent Gallo’s memorable 1998 indie film that weaved Buffalo football history into a bizarre Western New York-centered tale. This is a vintage original from the earliest-known full-sized (24″ x 36″) poster line ever published for consumer sale – a series of AFL and NFL team theme art posters published between 1966 and 1968. There’s no copyright info on the posters, no artist information, and we’re not even sure where they were sold; but the pure-’60s artwork is brilliant, and all teams of the era were included, including the Bills franchise that was still enjoying the glow of back-to-back championships. If anyone has more details about this series, please leave comments on this blog entry! 1. “Machine Gun Kelly” Jim Kelly Theme Poster – Costacos Brothers 1987 – To this day, we get more requests for this one than for any other Buffalo-related classic. Personally, I’m not a big fan of the kitschy 1980s Costacos Brothers theme poster line (yes, there were actual Costacos Brothers – John and Tock Costacos, Seattle-based entrepreneurs), but you can’t argue with success, and you can’t argue with public demand! Featuring the legendary Buffalo Bills QB playing off his on-field gunslinger reputation, this now impossible-to-find poster truly brings you back to the glorious ’80s – the style is unmistakeable, and man, does Jim look young! Thousands of you had this one posted to your bedroom wall back in the day, but how many survived post-adolescence or redecorating? We’re guessing – not too many. 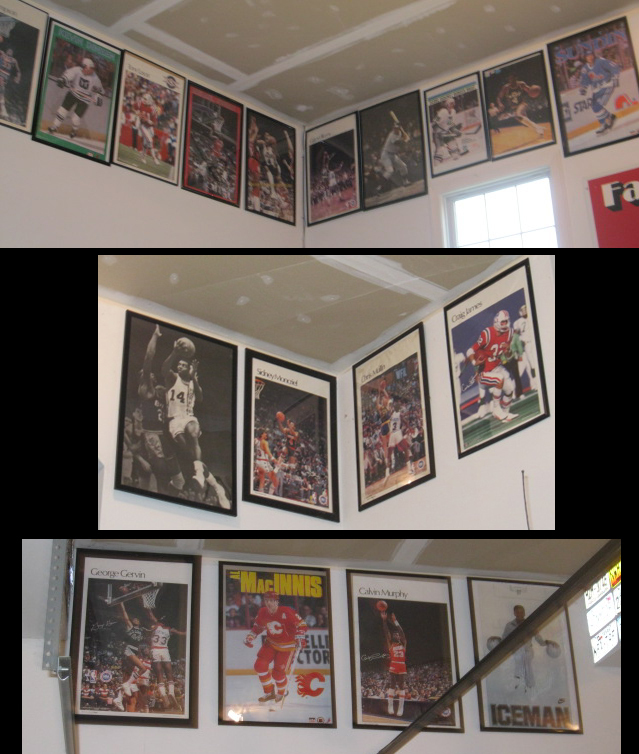 Yes folks, it’s true, Sports Poster Warehouse sells more than just sports posters! In addition to our brand new line of pennants, we also have an extensive collection of motorsport posters. In addition to Motocross, Formula 1, and Grand Prix Classics, Sports Poster Warehouse is also proud to showcase our collection of “Cool Car” posters. The newest member of our “Cool Cars” section is none other than the Chevrolet Corvette AMERICA THE BEAUTIFUL Poster. The Corvette, manufactured since 1953, is an American icon. There have been 6 generations of the Corvette over the years, each having been award winning automobiles. The Corvette was Motor Trend magazine’s Car of the Year for 1984 and 1998 and the 1999 Corvette Convertible was named “Best Engineered Car of the 20th century” by the Society of Automotive Engineers. Bring your wall alive with a spectacular, patriotic trio of the finest in American automotive engineering – the Chevrolet Corvette! This poster celebrates the legendary automobile with great style and design. Amazing poster for the wall of anyone who loves automotive beauty! Kevin Durant’s First Ever Poster! Celebrating the first superstar of the Oklahoma City Thunder! This amazing poster features the dynamic scoring sensation Kevin Durant, looking great in his new OKC threads as he rolls to the hoop for an easy deuce. Spectacular action, awesome design – perfect for the wall of any fan, and a valuable first-season collector’s item for years to come! For this and many other great NBA player posters, go to www.sportsposterwarehouse.com. This amazing piece celebrates Utah’s dominating Sugar Bowl victory at the Louisiana Superdome with amazing photography, spectacular design, and all the commemorative logos and details from the victory that capped Utah’s 13-0 perfect season. From the world’s leading sports photography marketer, Photo File Inc., this is a high-quality, fully-licensed 16″x20″ print, published on heavy photographic stock, and affixed with an official NCAA Properties holographic logo for authenticity. For this and many other commemorative NCAA posters, check out www.sportsposterwarehouse.com.